"The oldest kingdom in Africa was located in Ta seti. The area is called Qutsul [sic! ], "The land of the bow". It had the earliest hieroglyphic inscriptions ever found, and guess what, this kingdom was located in Sudan." The claim that the earliest hieroglyphic inscriptions ever found originated at Qustul (and that Egyptian civilisation therefore "must have originated in Ancient Nubia, and spread from South to North") is frequently repeated by others on the Internet (for example, in 'They Hail From the South: The Qustul Censer', and in this post from the forum on GrahamHancock.com, Re:3800-3100 B.C. Qustul. Is this claim true? Specifically, when and where were the earliest hieroglyphs yet discovered found? If they were not found in Qustul in Ancient Nubia, why do so many people claim that they were? The earliest known Egyptian hieroglyphic writing so far discovered was found in tomb U-j at Abydos, dating to about 3250 BCE. The tomb was excavated in 1988 by Günter Dreyer and his team, and the results published in Umm el-Qaab I: das prädynastische Königsgrab U-j und seine frühen Schriftzeugnisse. They concluded that tomb U-j was the final resting place of a ruler or elite-member of the Pre-Dynastic society (sometimes referred to as Dynasty "0") in the region. The tomb contained a number of inscribed labels, and some of these represented the formative phase of Egyptian hieroglyphic writing. Even more recently, a broadly contemporary date (c. 3,250 BCE) has also been assigned to a group of early hieroglyphic symbols discovered in 2017 at the Ancient Egyptian city of Elkab, by a joint expedition from Yale and Royal Museums of Art and History (Brussels). In 2016, Ilona Regulski, Assistant Keeper at the British Museum, published an article titled The Origins and Early Development of Writing in Egypt which presents our current understanding of the subject, from those earliest examples of the formative phase of Egyptian hieroglyphs , through to the earliest-known continuous written text which dates to the reign of Netjerikhet (better known as Djoser) half-a-millennium later. "... the find-spot of the U-j inscriptions has prompted the theory that the Egyptian writing system was born in the Abydos region." The archaeological site of Qustul lies to the north of the second cataract of the Nile, some 250 miles south of the Ancient Egyptian city of Abydos, and now largely submerged under Lake Nasser. 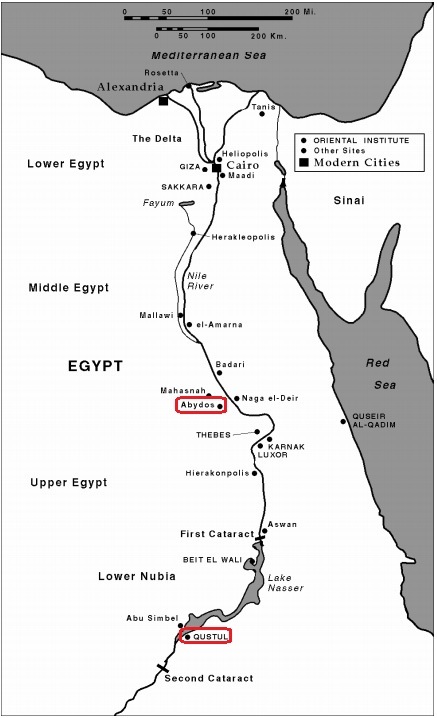 The Nile cataracts formed a barrier to river transport in antiquity, and the first cataract (at modern Aswan) was for long periods the southern border of Ancient Egypt. The cemeteries at Qustul were originally excavated in 1964 by a team from the University of Chicago. "No such claim was made in that article or in any other publication which has had my advance approval". Finds made during the UNESCO Campaign at a terminal A_Group (before 2900 BC) cemetery at Qustul prompted B.B. Williams to suggest that the pharaohs of the Egyptian Dynasty "0" buried at Abydos were ideological and cultural heirs and perhaps even descendants of the rulers buried at Qustul and thus the final unification of Egypt and Pharaonic kingship could look back to Nubian origins. The original paper was challenged by William Y. Adams in a 1985 article titled Doubts about the "Lost Pharaohs" in the Journal of Near Eastern Studies, (Vol. 44, No. 3 (Jul., 1985), pp. 185-192). This paper also attracted criticism, often as much for its tone as its content. The key factor in the controversy was an artefact known as the 'Qustul Censer', or 'Qustul Incense Burner'. Williams claimed that it is made out of a local clay, found in Nubia, was made in a Nubian style, and therefore the Pharaonic iconography found on it must be Nubian in origin. Adams, supported by David O'Connor suggested the censer was actually carved from limestone which, for reasons discussed below, would imply an Egyptian origin for the censer. Williams maintained that the idea that the censer was carved from limestone had already been ruled out. Eventually, the Oriental Institute conducted x-ray florescence (XRF) analysis on the censer (one might reasonably ask why this had not been done earlier since XRF is non-destructive and inexpensive). This revealed that it was, indeed, made of limestone (as is now noted on the Institute's web page link above). There are no limestone outcroppings anywhere near Qustul. Therefore, either the completed object, or the raw limestone block from which it was carved, had to have been imported to the area. 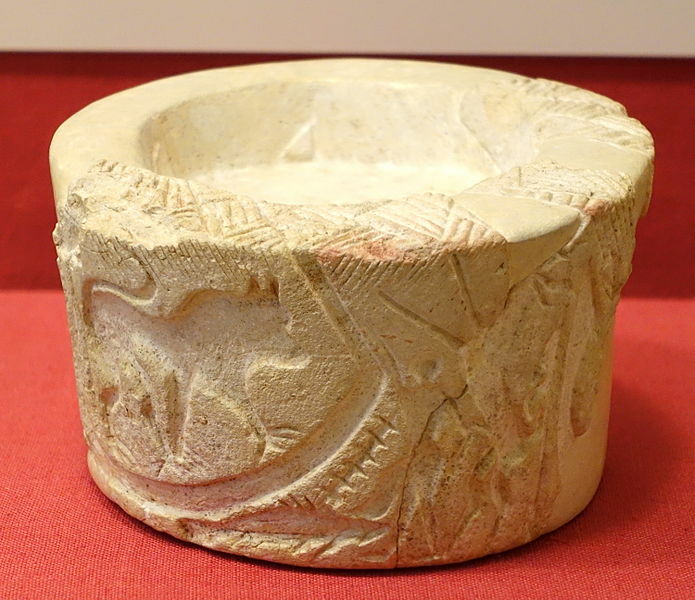 The censer was not the only carved limestone object found at the 'A-group' cemeteries at Qustul, so the idea that the raw material might have been imported is not that unlikely. However, the other objects are either undecorated or have only simple incised lines. Furthermore, there is no other evidence that the terminal A-group culture had any significant tradition of limestone carving. "... those buried [in the Qustul cemeteries] are not precociously early Egyptian pharaohs. They are more likely rulers of a complex chiefdom that covered all of Lower Nubia." Chiefs or Kings? Rethinking Early Nubian Politics - David O'Connor. ... this theory [i.e. by Bruce Williams] is now directly contradicted by the discovery at Abydos of a royal burial [tomb U-j, discussed above] that predates Qustul. Unfortunately, despite the fact that it has been three decades since Williams' original theory was disproved, it doesn't take much effort to find it being used to support 'alternative' interpretations of Egyptian history (just try a Google search for Qustul censer). Some of these instances may, of course, just be examples of poor scholarship, and a failure to follow-through on research. However, given the consistency in the content of many articles, and their association with other articles that present a similarly misleading interpretation of Egyptian history, it is hard to believe that the use (or abuse?) of Williams' theory in those cases is not deliberate. * - Indeed, far from being "brushed under the carpet" by "white Western Academia" as claimed in one of the articles quoted in the question, many of the results returned by a Google search for Williams' paper are for undergraduate reading lists, where the controversy is still used as an example of interpretative problems in Egyptian archaeology. ** - The question was actually laid to rest even before the invention of the Internet in 1989! Not the answer you're looking for? Browse other questions tagged ancient-history ancient-egypt writing or ask your own question. Who discovered cancer in Egyptian mummies? Was Abu Simbel also designed to serve as a border between Egypt and Nubia?